Willa Sibert Cather, Nebraska's most noted novelist, was born in 1873 in Virginia. At the age of ten, she moved with her family to Webster County, Nebraska, and lived on a farm there for two years before moving into the town of Red Cloud. Many of Cather's acquaintances and Red Cloud area scenes can be recognized in her writings. 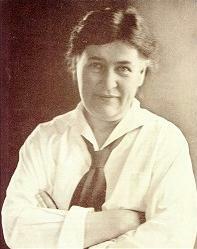 Cather was graduated from the University of Nebraska in 1895. While attending the university, she was a drama critic for the Lincoln Journal. She worked for Home Monthly and the Daily Leader in Pittsburgh, Pennsylvania and later taught English and Latin at Allegheny, Pennsylvania. She moved to New York and became the leading magazine editor of her day while serving as managing editor of McClure's Magazine from 1906 to 1912. Cather continued her education and received a doctorate of letters at the University of Nebraska in 1917. She also received honorary degrees from the University of Michigan, the University of California, and from Columbia, Yale, and Princeton. Cather wrote poetry, short stories, essays, and novels, winning many awards including the Gold Metal of the National Institute of Arts and Letters. In 1922, she won the Pulitzer Prize for her novel, One of Ours, about a Nebraska farm boy who went off to World War I. Her novel, A Lost Lady, was made into a silent movie in 1925. It premiered in Red Cloud, Nebraska and starred Irene Rich. Another movie of A Lost Lady was made in 1934, starring Barbara Stanwyck. Other well-known Cather novels include My Antonia, O Pioneers, Death Comes for the Archbishop, and The Professor's House. Cather died April 24, 1947 in New York. The story of an engineer in Boston who has everything in his life but is still not happy. He finds his old flame, an Irish actress, and begins an affair that threatens to bring his entire world down. Follows Antonia Shimerda during the great migration west.